In recent years, Mexico has rapidly developed into one of the world's most popular tourist destinations, with Cancun standing out as one of Mexico's best spots for visitors of all ages and backgrounds to enjoy. Located in the south-eastern part of Mexico on the Yucatan Peninsula, Cancun is a city in the Quintana Roo state and consistently ranks as one of the top touristic spots in all of Mexico, attracting big crowds of visitors from all over the globe with its stunning resorts, upscale hotels, white sand beaches, and exciting attractions. If you're planning a trip to Cancun and plan on flying in, you'll be landing at the city's main airport: Cancun International Airport. The airport code for Cancun International Airport is CUN. What is the Cancun Airport Code? The main airport for the city of Cancun and the surrounding resort area is Cancun International Airport. The airport code for Cancun International Airport is CUN. This airport is actually located in Cancun in the state of Quintana Roo, only a short distance from many of the big Cancun resorts and beaches. The address for airport code CUN (Cancun International Airport) is Cancun International Airport Carretera Cancun-Chetumal KM 22 Cancun, Q. R., Mexico. To get in touch with this airport by phone, you can contact 998 848 7200. The history of airport code CUN, Cancun International Airport, goes back all the way to the 1940s. During the Second World War, an airbase was constructed in the Cancun area by the United States military and used for training purposes. When the war ended, it was decided that this airport would subsequently be used for commercial flights and travel. As word spread about the beauty of the Cancun area, the airport had to expand and develop to cope with increasing levels of air traffic and aircraft movements. This led to Cancun International Airport (CUN) having several new terminals and facilities. The airport has actually played a major role in helping to support and boost the tourism industry in Cancun and in Mexico as a whole, with CUN being cleverly developed and constructed over the years to accommodate huge numbers of flights and passengers without any problems. In 2007, the third terminal building at Cancun opened up, and ten years later, a fourth terminal building was opened to add even more space and options to this thriving Mexican airport. Cancun International Airport (CUN) is not only the main airport for Cancun, it's one of the main airports for Mexico in general and is the country's second busiest airport, trailing only to Mexico City International Airport in terms of passenger traffic. CUN airport is the busiest airport in Mexico in terms of international traffic and handles more than 23 million passengers on an annual basis, with that number rising from one year to the next as Cancun becomes increasingly popular. This airport features two runways and four terminal buildings. CUN is a focus city for several airlines including Volaris, Aeromexico, and Interjet. Many major airlines operate at CUN airport including Air Canada, Air France, American Airlines, British Airways, Condor, Delta Air Lines, Eurowings, Interjet, Frontier Airlines, Lufthansa, Southwest Airlines, TUI Airways, and Virgin Atlantic. The most population destinations from CUN airport are Mexico City, Mexico; Monterrey, Mexico; Houston, United States; Chicago, United States; Guadalajara, Mexico; Toronto, Canada; Atlanta, United States; and New York City, United States. 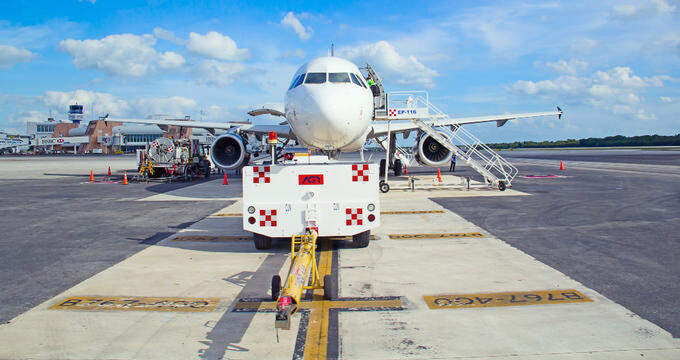 If you need to park your car at Cancun International Airport, you'll find that the parking layout and systems are very simple and easy to understand. The main parking lot at CUN airport is situated relatively closely to the terminal buildings, offering quick and easy access to the check-in desks, arrivals area, and security lines. Parking at CUN airport costs 36 pesos per hour or 215 pesos for a day. Cancun International Airport (CUN) has a lot of good ground transportation links to help you get all around the Cancun area. If you'd like to get around Cancun by yourself, you'll find many different rental car companies at the airport. You'll also find a lot of different public bus routes running straight from the terminals to key areas all around Cancun, making it easy to get to your hotel or resort straight from CUN airport. Finally, if you're traveling with heavy luggage or simply prefer a private ride to a specific destination, you can choose to hire a taxi or organize a ride share from CUN airport. There are no hotels right on the airport grounds at Cancun International Airport, but plans are in place for the construction of an on-site hotel in the future. If you'd like to stay near the hotel and have easy access to the terminals, there are lots of good accommodation options very close by. Read on for names and addresses of the best hotels near Cancun Airport.